NYC Smile Design - BLOG - What if your Adult Teeth Don't Grow In? In our previous blog, we have written about the importance of taking care of your teeth because they have to last a lifetime. We also discussed that we have 20 baby teeth which are replaced with 20 adult teeth, plus additional molars which grow in during early adulthood. But occasionally, there are cases of people whose adult teeth don't always grow in as expected, and one of our patients was just such a case. Diane first came to us because two of her teeth had broken. But during our examination, we noticed she'd had extensive dental work done previously because her permanent eyeteeth had never grown in – they were severely impacted, lying sideways under her eyes. Ultimately,they had been extracted, and Diane had been given braces to pull the rest of the teeth together. 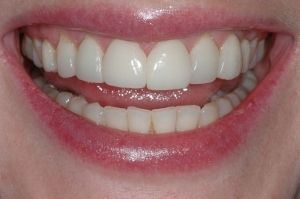 However, after the braces were removed, there were remaining gaps, which were then closed by veneers. When she came to our office and learned that there were other options available to her, Diane decided to give her smile makeover another go. 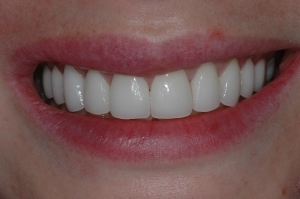 Together, we decided to reconstruct the broken teeth, and add new, custom veneers for all of her top teeth. So even if you don't grow up with the full component of the teeth you should have had, you can still take good care of the ones you were born with, and even improve on nature with the right dentistry.